Environmental: Responsible for large fish kills, leading cause of death of manatees ( an endangered species ) and blamed for many dolphin deaths. Health Ramifications: Can cause respiratory symptoms ( especially in sensitive populations like asthmatics ) and has been implicated in the cause of skin irritations. When contaminated shellfish is consumed, it can cause Neurotoxic Shellfish Poisoning ( NSP ). Globally, harmful algae blooms ( HABs ) cause a variety of problematic human and environmental health issues. In Florida, K.brevis blooms create the specific collection of effects shown at left. The following questions and answers address some of the most frequent concerns about the effects of red tide. Can I go to the beach during a red tide bloom? Aerosols from red tides can produce respiratory ailments including coughing, sneezing, or tearing. This occurs when red tide is present along the coast and the winds blow its toxic aerosol on shore. These effects are generally temporary and should vanish within a few hours of leaving the beach ending the exposure. However, studies show that people with severe respiratory conditions like emphysema or asthma should be especially careful. If you are an asthmatic and you elect to go to the beach during a red tide, be sure to have your short-acting inhaler with you at all times. If you experience uncomfortable symptoms, leave the beach and surrounding area immediately.To find out what the respiratory conditions are at your favorite beach, check the Beach Conditions Report. Can I go swimming during a red tide? Yes, swimming is safe for most people. However, skin irritation and burning eyes can be experienced by some people. As with respiratory irritation, common sense is important. If you have particularly sensitive skin that is easily irritated, avoid red tide water. If you experience skin irritation while swimming, leave the water and thoroughly rinse off with fresh water. Swimming near dead fish is not recommended, as they are associated with harmful bacteria. Can I eat seafood during a red tide event? Commercially caught seafood (including seafood at local restaurants and grocery stores) is safe to eat because it is closely monitored for K. Brevis toxins. The State of Florida quickly closes shellfish beds in red tide areas and will not re-open them until shellfish are safe to eat. For recreationally caught seafood, it is important to follow a few guidelines. Finfish are safe to eat if they are caught live and filleted. Crabs and shrimp are also okay to eat because the toxins are not absorbed into edible tissues of these animals. It is not safe to eat bivalves (clams, mussels and oysters) from red tide areas because they are filter-feeders and the toxins are absorbed into their tissues. To check the health status of shellfish beds, contact the Florida Department of Agriculture and Consumer Services. Remember, cooking does not destroy red tide toxins. Do not ever eat distressed or dead animals regardless of whether red tide is in the area. Consumption of shellfish that are contaminated by K. brevis toxins can cause Neurotoxic Shellfish Poisoning (NSP). NSP symptoms usually appear within a couple of hours of eating contaminated shellfish and they last for a few days. Symptoms can include: gastro-intestinal distress, reversal of hot and cold sensations, headache, chills and generalized muscle weakness. How does red tide affect the environment? The same harmful toxins that cause respiratory irritation in humans can also cause mortalities in various marine organisms. In addition to killing many fish and contaminating shellfish, K. brevis blooms can kill marine animals including dolphins and endangered manatees. A red tide in 1996 was responsible for the death of nearly 10 % of Florida’s manatee population and 162 dolphins in Mexico. 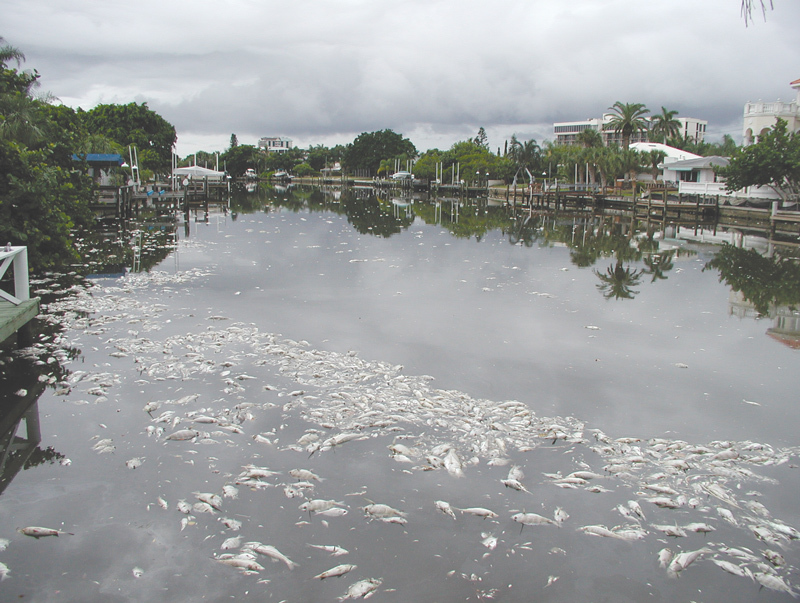 The extremely large red tide bloom of 2005 resulted in an extensive hypoxic zone off the coast of Southwest Florida. Within this hypoxic zone, there was a significant die-off of benthic or bottom-dwelling organisms.